Common Name: Perilla leaf, Purple perilla leaf. Source of Earliest Record: Benjing Jizhu. Part Used & Method for Pharmaceutical Preparations: The leaf is picked in July and August and dried in the shade. Properties & Taste: Pungent-spicy and warm. Functions: 1. To release the exterior symptoms and disperse cold; 2. To promote the flow of qi in the spleen and stomach; 3. To alleviate fish and crab poisoning. 1. Wind-cold type of common cold manifested as fever, chills, headache, nasal obstruction and cough. Perilla leaf (Zisuye) is used with Fresh ginger (Shengjiang), Tangerine peel (Chenpi), Cyperus tuber (Xiangfu) and Apricot seed (Xingren) in the formula Xing Su San. 2. Qi stagnation in the spleen and stomach manifested as nausea, vomiting and fullness sensation in the chest or abdomen. 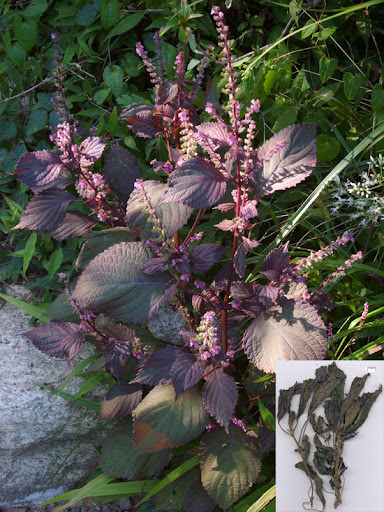 Perilla leaf (Zisuye) is used with Agastache (Huoxiang) for cold manifestations. If there are more heat signs, Perilla leaf (Zisuye) can be prescribed with Coptis root (Huanglian). For cases with qi stagnation and accumulation of phlegm, Perilla leaf (Zisuye) is used with Pinellia tuber (Banxia) and Magnolia bark (Houpo). For vomiting during pregnancy, Perilla leaf (Zisuye) is used with Tangerine peel (Chenpi) and Amomum fruit (Sharen). 3. For vomiting during pregnancy, it is used with Pericarpium Citri Reticulatae (Chen Pi) and Fructus Amomi (Sha Ren). 4. Fish and crab poisoning manifested as vomiting, diarrhea and abdominal pain. Perilla leaf (Zisuye) is used with Fresh ginger (Shengjiang) and Dahurian angelica root (Baizhi). Dosage: 3-10 g, decocted in water for internal use. Cautions & Contraindications: Not to be decocted in water over a long period of time.